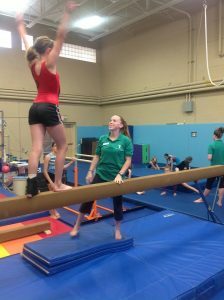 Do you have a child that wants to go to traditional camp AND loves gymnastics? Now they can do BOTH! This camp is perfect for the child that has the heart of a gymnast AND a camp mindset. Drop off is at the Westerly YMCA between 8:30 am and 9:00 am. Campers may be picked up at Camp Watchaug at 4:00 pm or ride a bus to the bus stop of your choice. Spend the morning learning recreational gymnastics skills – from basic moves to the uneven bars. Small group instruction based on the camper’s experience and ability. Fun for all levels! Campers will be transported by bus to Camp Watchaug for the afternoon where they will swim and participate in traditional outdoor camp activities.